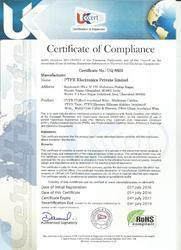 We, PTFE Electronics Pvt. Ltd., are engaged in manufacturing, exporting and supplying PTFE insulated High Voltage, High Temperature & High Frequency Specialty Equipment Wires, Multicore Cables and Sleeves. Our range include PTFE Hook-up Wires & Insulated Equipment Wires, PTFE Multi-Core Cables, PTFE Sleeves & Tubes, PTFE RF Coaxial Cables, Double Shielded Cables, PTFE Double Shielded Cables & Triaxial Cables, PTFE High Voltage Corona Resistance Wires, PTFE Thermo-Couple Wires and PTFE insulated RTD Cables. Over the years we manufactured wires and cables that are being used in Marine Application, Defence Applications, Aerospace Applications, Power Supply Systems, Various Lighting And Signaling Applications Of Railways & Radars, Excavators and other precision applications. Our offered products are stringently tested by our quality controllers on set quality standards to ensure high performance at users end. Located at Ghaziabad, Uttar Pradesh, we are led by our mentor Mr. M. K. Agarwal, who have many years of industry experience. Owing to his vast experience in the Industry we have been able to establish ourselves as one of the leading player in this domain as quality supplier in very short span of time. In addition, the competitive prices of our products has also helped us to make many quality conscious clients in the global markets and cater sectors like Defence, Telecom, Aerospace and Instrumentation Industries. Various Big Private and Public Sector Companies. High Temperature Wires and Cables- PTFE Insulated wires and cables, Silicone Rubber Wires and Cables, Fiber Glass Insulated Wires and Cables. Be recognized as a leading global player and India's No 1 Supplier providing PTFE cabling solutions to the electrical connectivity requirements of industrial users. To be the first choice of the customer for PTFE Electrical solutions by following all customer-centric approach to the business and to be the most reliable and most trusted supplier in the industry. Quick and cost effective delivery of small orders. Plant equipped with all modern machine and equipment. Quick delivery of orders supported by large manufacturing capacity. Custom designing of high-temperature cables sustainable even up to 1500°C. Seasoned professional experts for designing complex and critical customer need. We would like to express our deep gratitude to all our customers for their unconditional support and trust shown to us for quality products. 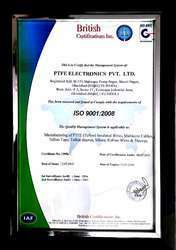 You all have made PTFE Electronics a leading designer, the manufacturer of High Voltage, High Temperature & High-Frequency Specialty Wires, Cables and Sleeves under PTFE (Teflon*) Insulation. We have complete in-house capabilities to design & develop a cable as per your requirements. Also, our manufacturing facilities are efficient and streamlined to gear up for the future. We assure to deliver you quality products and our best attention to your demands and orders, to be one of your reliable suppliers. 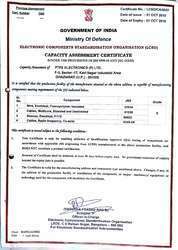 Our production facility is has been certified by LCSO, Ministry of Defence, India. Our consistent approach towards delivering superior quality in our products has enabled us to manufacture products that meet the requisite Indian standard JSS-51034, JSS-54802, JSS-51038 and JSS-6145-24 these are equivalent to international standards like MIL-W-16878 & BS3G210. With experience gained over the years, we understand technical requirements of industry and are involved in the development of various new products that are more cost-effective and efficient than the products that are popular in the market. To be a preferred supplier of quality products in the industry 100% production is tested in laboratory specially designed for the purpose and test report is prepared and kept for records. The salient features of our wire products include heat resistant, chemical inertness, fire resistant, flame retardant, higher shelf life in controlled atmospheric conditions (-200°C to +260°C), halogen free insulation and sheath. At PTFE Electronics business model is evolving. We are regularly enhancing our key internal operations to ensure a consistent and positive experience for our customers. Our business processes begin and end with the customers. We are confident that your confidence and trust in us will keep us ahead and win in our constant endeavor to continue to be the preferred supplier in this competitive global market. We are improving each day to serve you better. Defense Electronics, Radar applications, Satellites and Missiles. OEM's for Defence, Marine, Naval and Aerospace applications and Air Crafts. For limited space and high current applications. Nuclear Power Systems and control equipments. Radio and Microwave Communication equipments. Excavators, lifts and High-Performance automobiles. Temperature Sensors, Transducers, Flow Meters and other sensors. Power-stations, UPS, Transformers and other Power supply Instruments. Fireproof wiring and wire harness in Furnace, Oven, Steel Plants, Cement Plants and much more. The promoters are highly qualified and experienced technocrats and employ well experienced, trained and qualified personnel for all operations. The promoters carry with them self a rich experience of more than 30 years in designing and manufacturing PTFE Wires and Cables. Our Key promoters have serviced the industry by developing and designing customized wires and cables especially the high-temperature cables for customers from various industries like marine application, defense applications, aerospace, power supply systems, railways signaling, UPS systems, excavators and much more. We understand it is only the integration of best people with modern technology that results in quality products and thus leads to creativity and innovation. Having thrust on quality, we ensure that only superior grade raw materials are used in our manufacturing process. Our raw material includes copper, PTFE resin and silver. We procure our raw material from various reliable sources and renowned brands. As a policy, we believe in direct marketing of our products against specific purchase orders. This is to enable us to offer the cost effective and most suitable products to our customers after due understanding and information on their applications and use. We also hope that you would give us a chance to add your esteemed organization in our customer's list as a feather in our cap. As we operate in the highly competitive global market, we ensure safe storage, transportation and delivery of our products to our customers. We use modernized techniques of packaging like reel packing and coil packaging. All products packed individually in polythene packets and then bulk packed in corrugated boxes/wooden boxes and then packed in HDPE bags if required. We have a wide range of PTFE insulated Wires and cables to cater to the wide range of our clients. 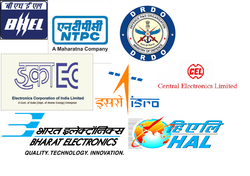 We have a wide network of clients speared all across India, Our Satisfied domestic clients include NTPC, BEL, ECIL, ISRO, DRDO, BHABHA, HAL, CIL, BHEL and many others public and private sector organizations. Being a quality-centric organization, we lay immense emphasize on the quality of the offered products. The raw material that we use to manufacture our product range is procured from reliable vendors of the market. We have a quality testing unit that is equipped with requisite testing equipment, which tests the offered products on the basis of set quality parameters. With the help of our extensively expanded distribution network, we are able to supply our product range within a predefined time frame. Owing to customer focused policies, we have gained the trust of a large number of satisfied customers around the country.